If you keep chickens, you naturally would prefer that your laying hens deposit their eggs in the nest boxes you've provided for that purpose—not outside on the ground, in the corners, hidden in tall grass, in hay bales, or any of the hundreds of other places that seem to appeal to them. It is a maddening fact of life for chicken keepers that hens often resist cooperating when it comes to laying their eggs. Chickens are creatures of habit, and they can be very stubborn about this behavior. But don't give up. There are several ways you can encourage your hens to lay in their nest boxes, ensuring that you get the maximum number of fresh, clean eggs. One box for every four to six hens is ideal for your hens to feel comfortable laying in them. Paradoxically, too many nest boxes will cause hens to use them to sleep and defecate in but less likely to lay eggs in them. Ensure that your nest boxes are in a dark, quiet corner of the coop. Hens have the instinct to lay their eggs in a safe place. Boxes should be at least a few inches off the floor. Make sure to collect eggs regularly, since a box already full of eggs isn't very appealing to a hen looking for a nesting spot. One or two eggs already in the box won't dissuade a hen from adding a few more, but most hens are attracted to an empty nesting box, provided they are clean and attractive. If you get into the habit of collecting eggs twice a day, chances are good that your hens will seek to fill up those empty spots with more eggs. 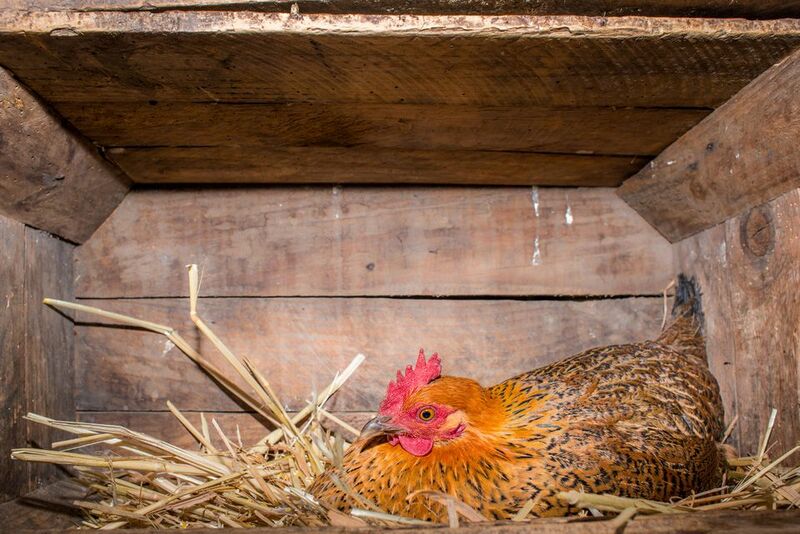 Ideally, you want your hens to lay eggs in the nest boxes, not to use them as "home." If the nest boxes are their only place to sleep, the boxes will quickly become messy with feces, leading to dirty eggs. But if you provide enough roosting spots, the chickens are more likely to sleep on the roosts and reserve the boxes for laying eggs. Train Your Chickens With a "Nest Egg"
You can purchase fake ceramic eggs from feed or supply stores, or use a golf ball. When your pullets get ready to start laying, placing the fake egg in a nest box will give them the hint that the boxes are "the place" to lay their eggs, too. If a hen has chosen the wrong nesting spot in which to lay her eggs, try to block it or make it otherwise unattractive to her. A ground site can simply be covered with a scrap piece of wood or ​another object. In other areas, rocks or plastic bottles heaped on her forbidden nesting site might be all it takes to convince her to return to the comfortable nesting box you've provided. Most hens lay early eggs in the day. By keeping them in the coop until most of the egg-laying is done, you maximize the chances that they'll lay in the nest boxes instead of finding a cozy place in the yard outside the coop. As shavings or other bedding materials get depleted in the nest boxes, hens tend to avoid them. Keep the shavings or straw in the nest boxes nice and fluffy, and change it regularly, to encourage your hens to lay there in the nest boxes rather than elsewhere. This takes some careful surveillance, but if you see your hen settling down in the illegal nesting spot, you can gently but insistently grab her and move her to an empty nest box. Sooner or later, she'll tire of being disturbed and start heading right for an available nest box when the spirit says it's time to lay. Chickens naturally stop egg production when daylight hours dwindle in winter. Not only will they stop laying eggs in nest boxes, they won't lay many at all, in any location. You can stimulate egg production by augmenting with artificial lighting so the hens receive at least 14 hours of light each day, using a combination of natural daylight and artificial light. Chickens that develop a habit of sleeping in their nesting boxes often refuse to lay eggs there, possibly out of an innate sense of hygiene. When you notice your hens settling down to sleep in the nesting boxes rather than the roosts, shoo them out, or physically grab them and place them on the roosts.